A short pizmon of four stanzas, each ending and commencing with the respective halves of Ps. xlvii. 6. It is chanted in the Sephardic liturgy before the first sounding of the shofar on the Day of Memorial, or New-year festival. 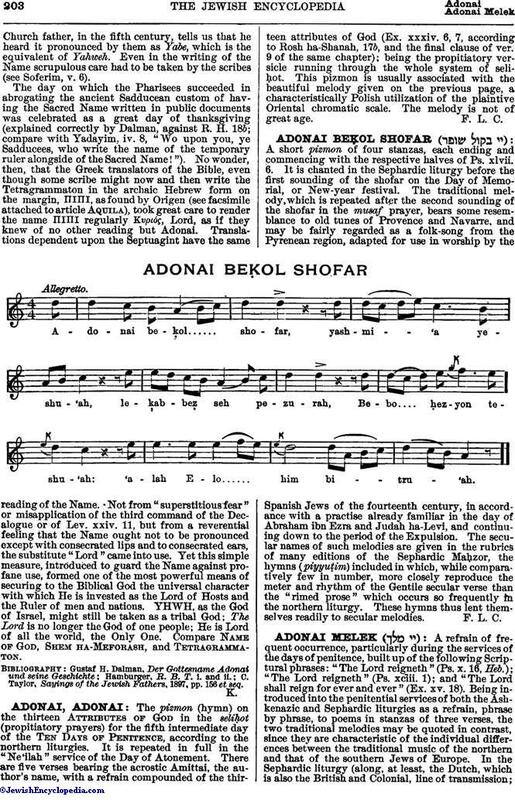 The traditional melody, which is repeated after the second sounding of the shofar in the musaf prayer, bears some resemblance to old tunes of Provence and Navarre, and may be fairly regarded as a folk-song from the Pyrenean region, adapted for use in worship by the Spanish Jews of the fourteenth century, in accordance with a practise already familiar in the day of Abraham ibn Ezra and Judah ha-Levi, and continuing down to the period of the Expulsion. The secular names of such melodies are given in the rubrics of many editions of the Sephardic Maḥzor, the hymns (piyyuṭim) included in which, while comparatively few in number, more closely reproduce the meter and rhythm of the Gentile secular verse than the "rimed prose" which occurs so frequently in the northern liturgy. These hymns thus lent themselves readily to secular melodies.